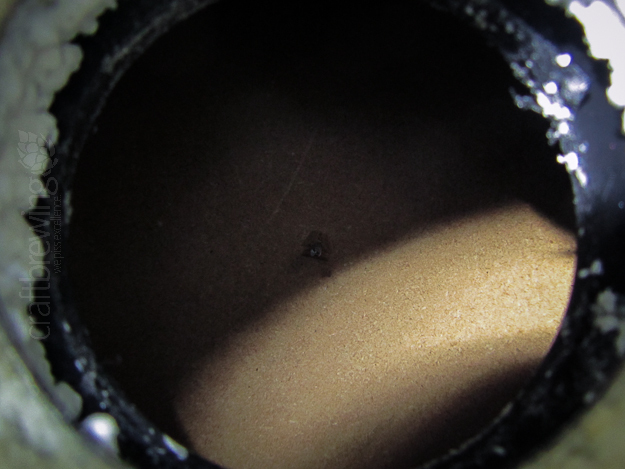 I’d been brewing beer for a few years, kegging right from the go. 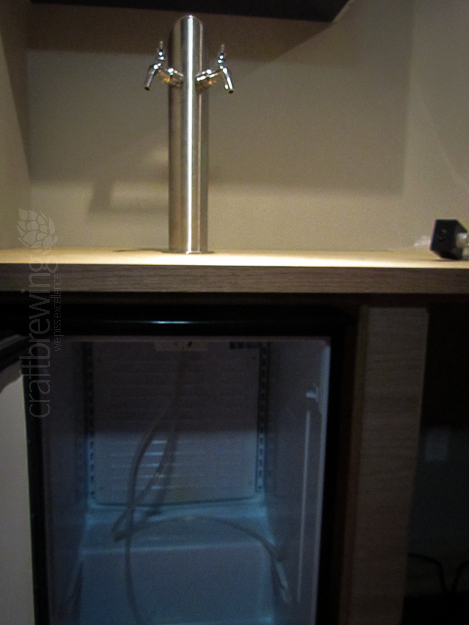 My serving method was to keep my kegs in a temperature controlled keezer, dispensing from plastic picnic taps. 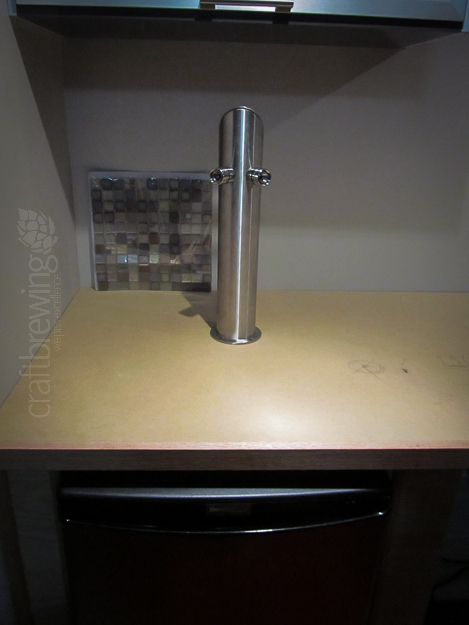 I usually had around four beers ready to serve, so I had four kegs in the keezer, swapping around the CO2 when necessary, cleaning up drops of beer from the bottom of the freezer, and generally living with the dream of having a bar that would showcase the homebrew on which I worked so hard. Now, the time has come. 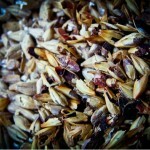 What follows is a fairly in-depth step by step pictorial of the process I followed to create my home bar. The first thing I did was to grab two Danby stainless refrigerators, which I found at Costco (Canada) for around $140 each. 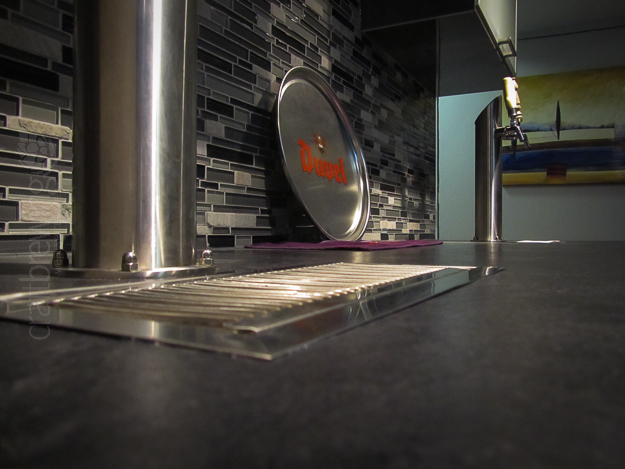 I was planning to have the fridge doors exposed, so I wanted a stainless finish that would match what I had planned. I wanted the fridges first, so I could work around their measurements. I began with a base, which was built partly out of 1/2″ plywood (for the sides and the back, which would basically always be hidden from view. 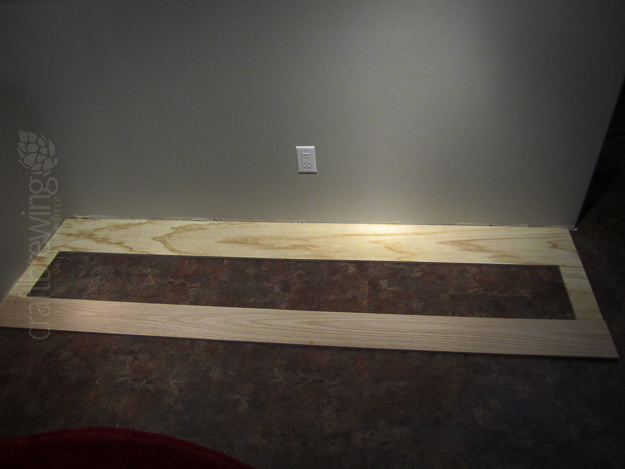 The front strip was 1/2″ oak plywood, as this would be the wood that would be on the exterior of the bar. I constructed square(ish) frames to act as the support beams for the counter, divisions within the bar, and backings for the face and right side exterior. 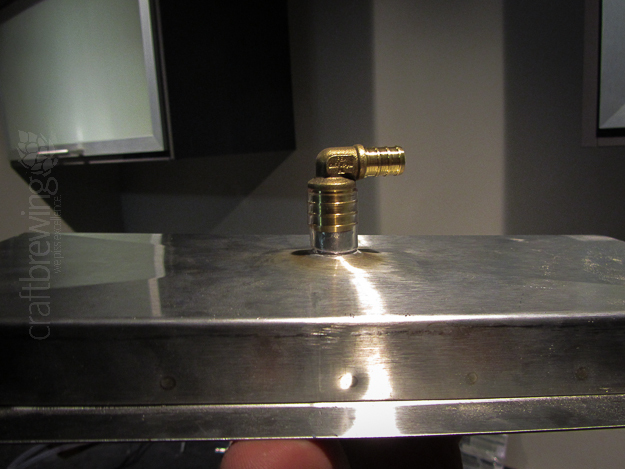 I had originally planned for the bar to be 1.5″ higher than I wound up making it. The original thought was to have 2 x 4s running lengthwise along the top of the square frames. Once I changed my mind (after building the stupid squares), I cut the top 2 x 4s to just fit between the squares. Not nearly as convenient…but easier than ripping apart the squares, cutting them down, and reassembling. Sigh. 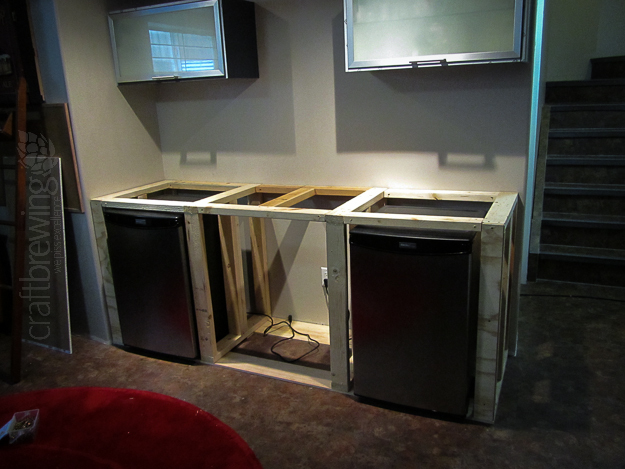 I built the fridge housing to give just a little room around each fridge. This wouldn’t allow for a ton of air moving in from the front, but I had faith that the open concept of the interior would help get around that. 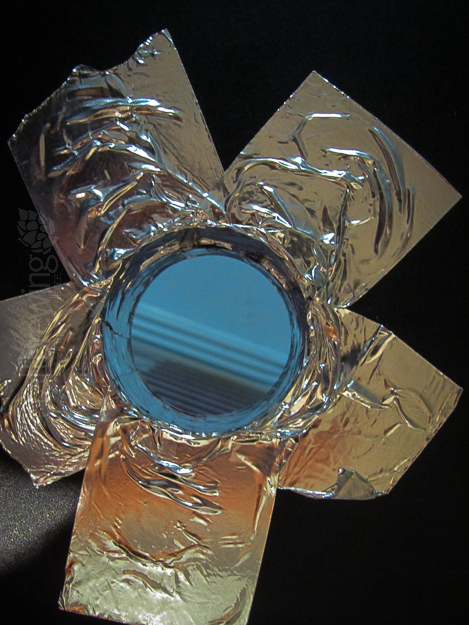 Also, I left the middle base strip open to the floor as part of a (almost a joke, here) poor man’s heat sink. 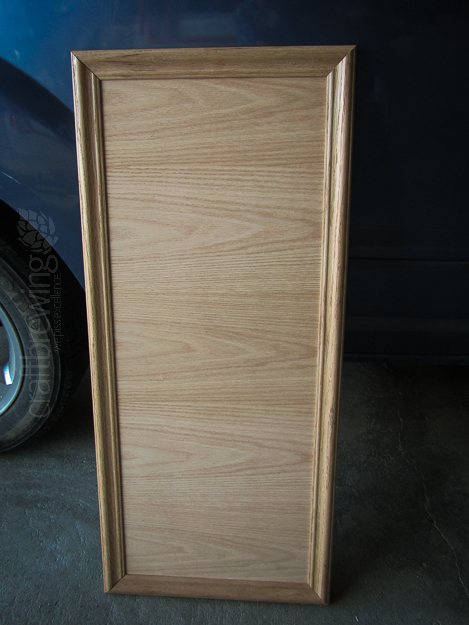 Next, I put on the exterior wood panels. 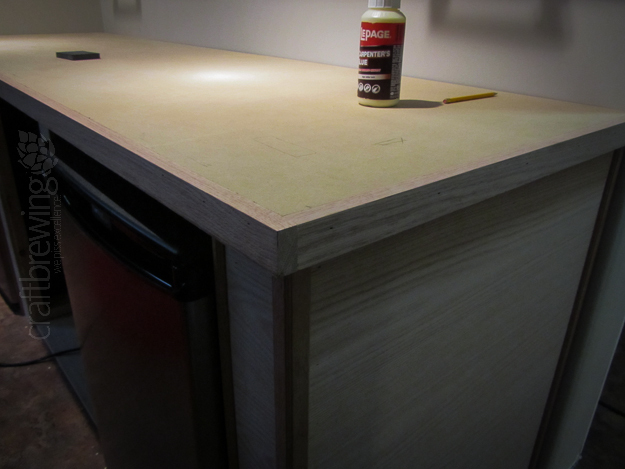 This was more of the 1/2″ oak plywood (I did all the oak work on my bar using one piece of 4 x 8′ plywood…I planned out my cuts very carefully!). To create a seamless look, I took a ton of measurements and cut the front as one piece. The parts cut out for the fridges wound up being used for the middle doors. I picked up a 4 x 8′ sheet of 5/8″ MDF, which I cut to place on top of the bar, allowing it to overhang about a 1/4″ all the way around. This would leave a slight gap between the oak walls and the oak strip I was about to add to the counter: 1 x 2″ oak strips, glued and brad nailed to the edge of the counter. This would give my bar counter a nice oak trim. At this point, I needed to know where the holes for the draft lines would go. I shifted gears and focused my attention back on the fridges. 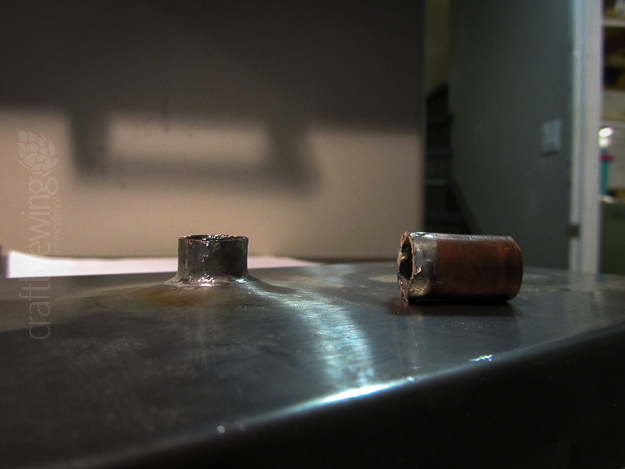 I determined where the coolant lines were (a post on that to come later)…they were running along the very front of the fridge, so the back was totally available. 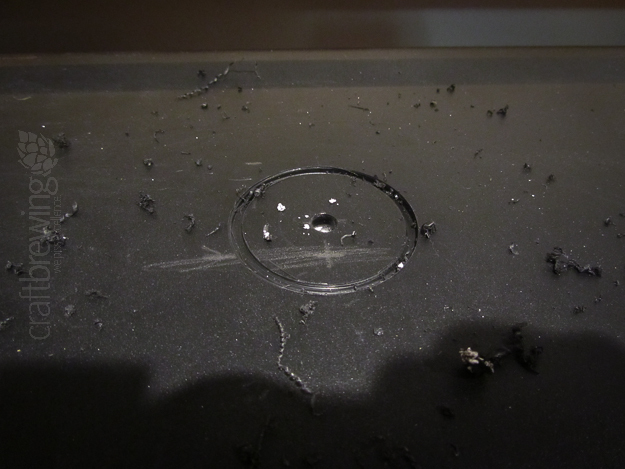 Using a 1.5″ hole saw, I began the arduous process of cutting through the top (going throught the metal really sucked!). 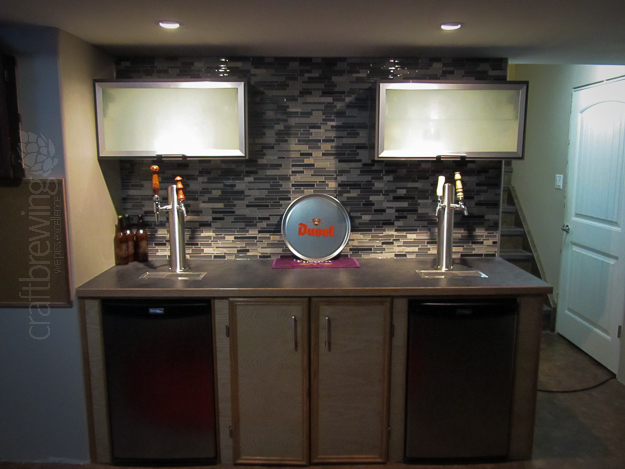 Once I got through, I positioned the fridges in the bar, exactly as I wanted them to be. I then used the hole saw from the inside up, as that would let me cut the hole through the MDF counter directly above the hole in the positioned fridge. 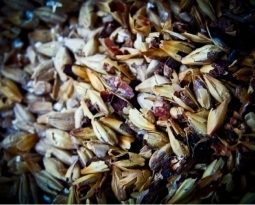 This, if you can imagine, was just a blast…lying with my head in the fridge, letting crap fall down onto my face. Once I had both fridges cut and the draft line holes cut, I was ready to begin sorting out getting the PVC line tunnel up and running. 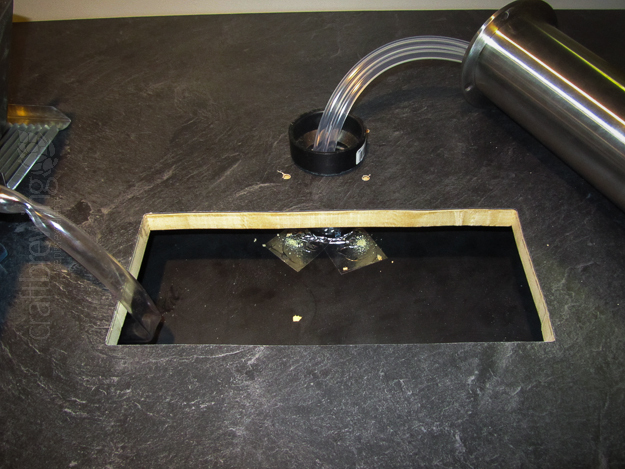 This was accomplished through a section of 1.5″ PVC pipe with a 2-1.5″ reducer. 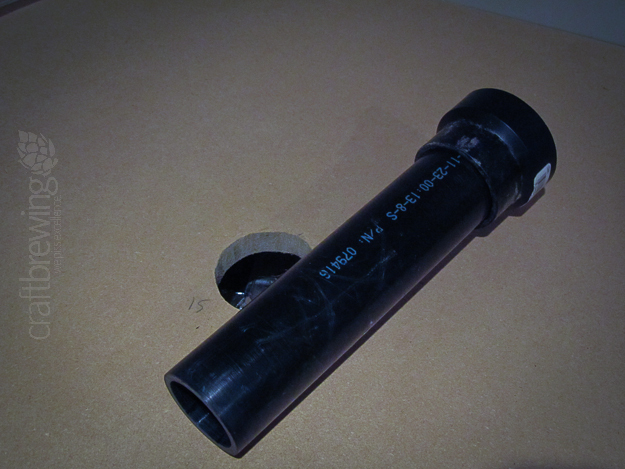 The reducer fitting was used to prevent the pipe from falling down through and into the fridge. 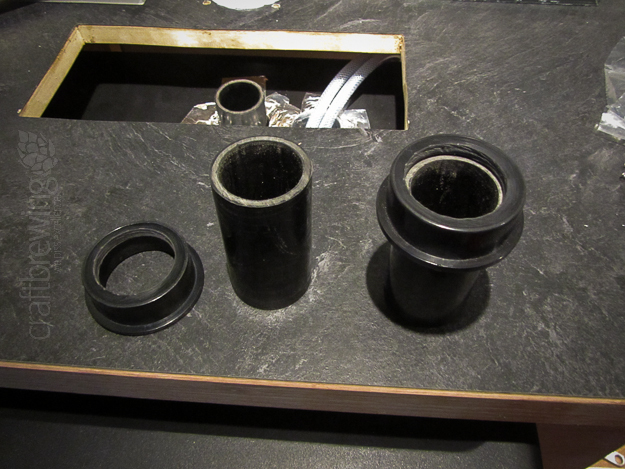 Between the counter and the fridges, these pipes would allow for minimal loss of temperature. 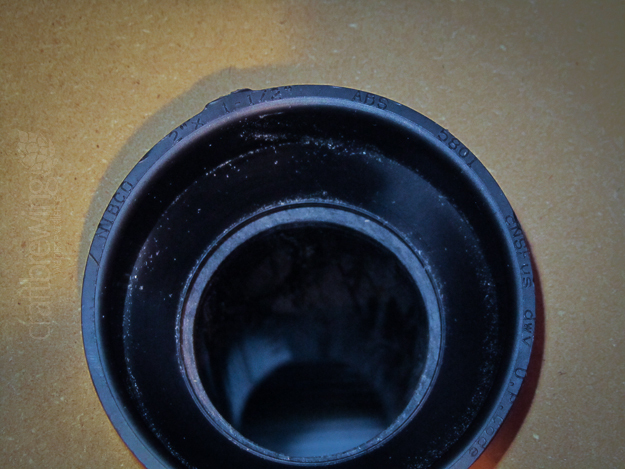 As it turned out, these reducers were also a perfectly snug fit into the towers I planned to install. Here’s another shot of the tower, as it was centred over the left fridge. In the back you can see my originally proposed tile selection, which I eventually cast aside in favour of something I thought would look much cooler. 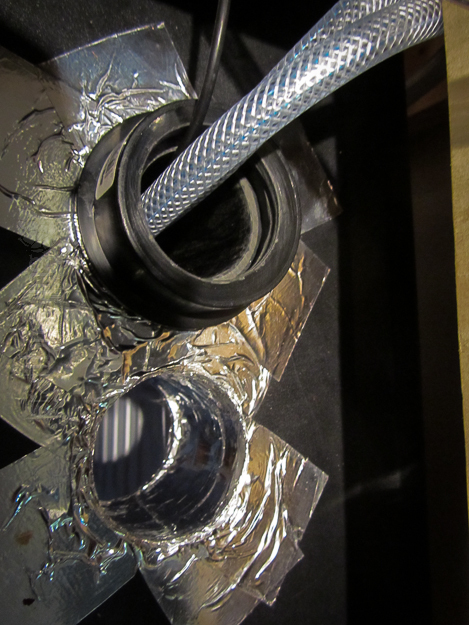 I used some aluminum ducting tape on the holes cut through the fridges, in an effort to maintain an efficient seal and secure tunnel through which the pipe would pass. With the job I did here, the PVC fits really quite tightly, requiring a decent effort to move around. I now had no worries about the security of this pipe. Here’s a shot of me testing out the positioning of the left tower with the draft lines hanging down into the opened fridge. Success! I was now ready to install the laminate sheet on my counter. I hauled my countertop out to the garage. I measured out the size of the drains and cut out holes for them using a jigsaw. Using contact cement, I coated both the MDF and underside of the laminate sheet with cement and attached them. Using a router, I cut around the edges and through the holes for the towers and drains. 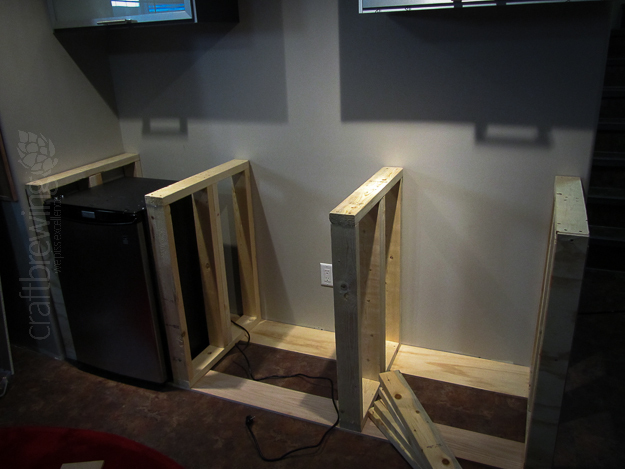 Then I returned the counter to the basement and prepared to install some of the hardware. I admit that I totally forgot to photograph this process, but I’m sure you can find tutorials online. If I ever do it again, I’ll document it. 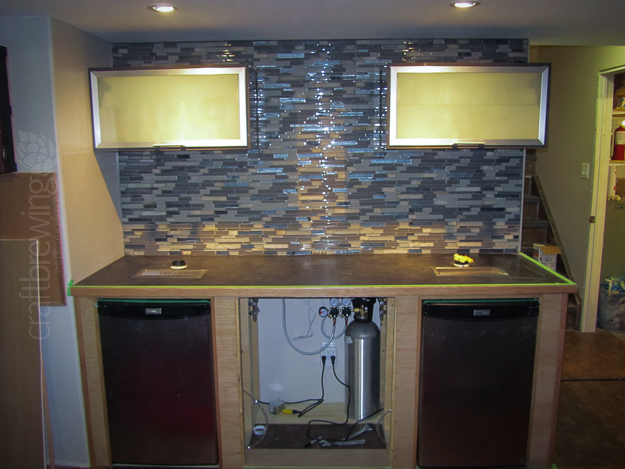 Here’s a shot of the bar with the towers and drains sitting in place, with my new selection of tile sitting in the back. 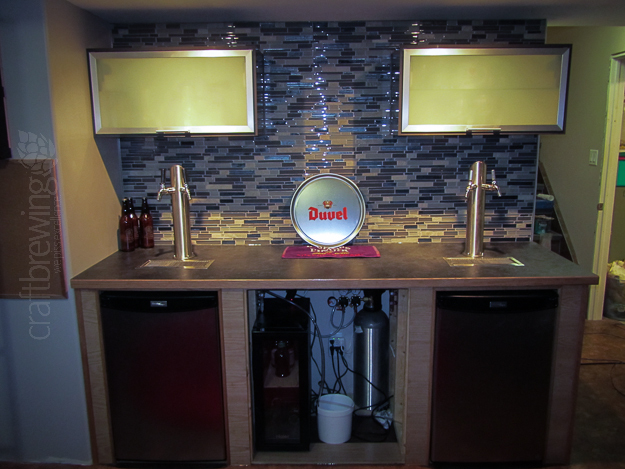 In case you’re wondering why I didn’t mention them yet, I actually installed the wall cabinets first, as I didn’t want to have to mess around with their install once my bar was build, towers installed, etc. I found that the space between my drains the the fridges below was a little shorter than I expected, so the pipes on the bottom of my drains needed to be shortened, allowing for my drain plans. 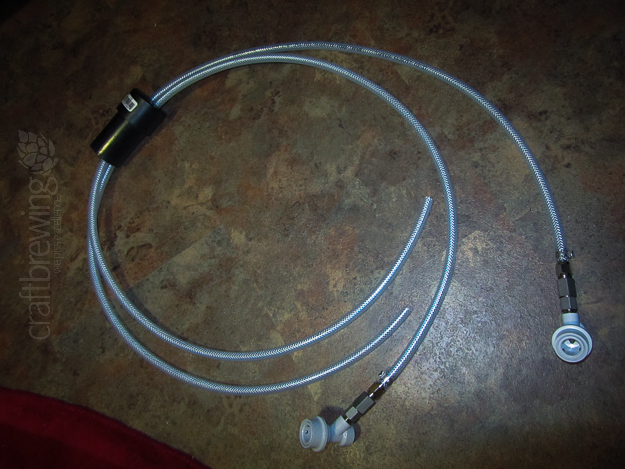 Next, I came to the realization that I needed a way to get my gas lines into each fridge…I didn’t feel like taking apart stuff in the back, and I knew I had room at the top, so I cut new holes in the top of each fridge, so I could run a second pipe into each for the gas lines. 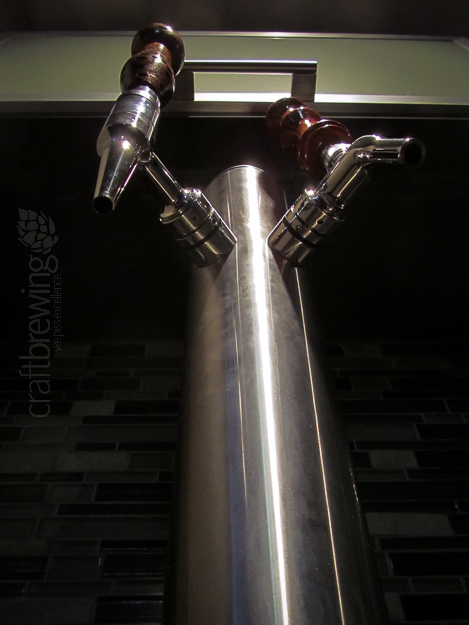 Here’s a sneaky shot of the pipes between the fridge and the counter. 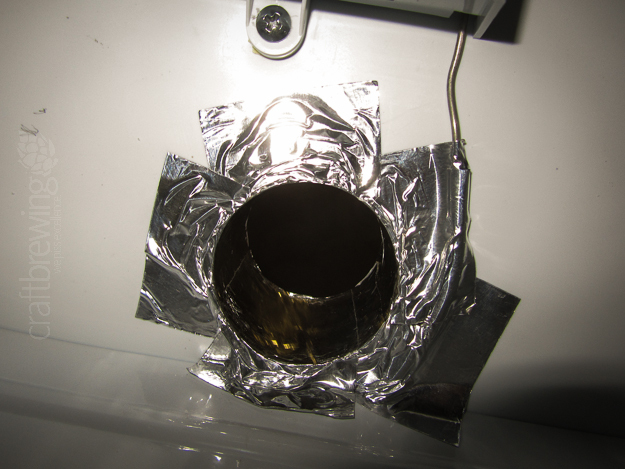 Now, I just had the issue of how to keep this pipe secure, insulated, and from falling into the fridge…I accomplished this with another end cap with holes for the lines and a short cap. The regular end cap was too tall to fit between the fridges and counter, since I needed the lines to bend to the side once they stuck out. 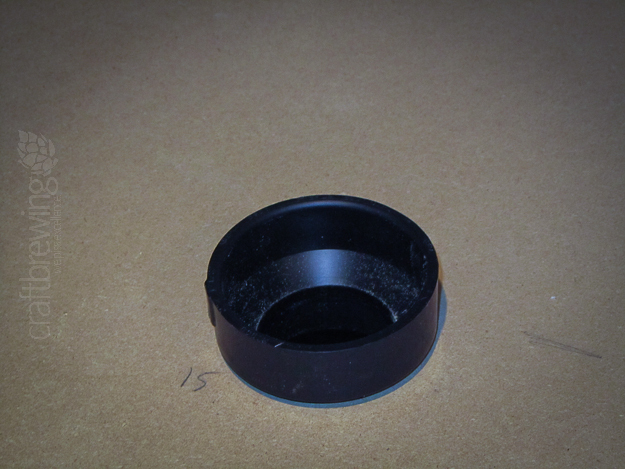 So, I just cut three holes in each large cap (two holes for each gas line and one hole for the power cord for the blower fans) and cut the whole centre out of the short cap. 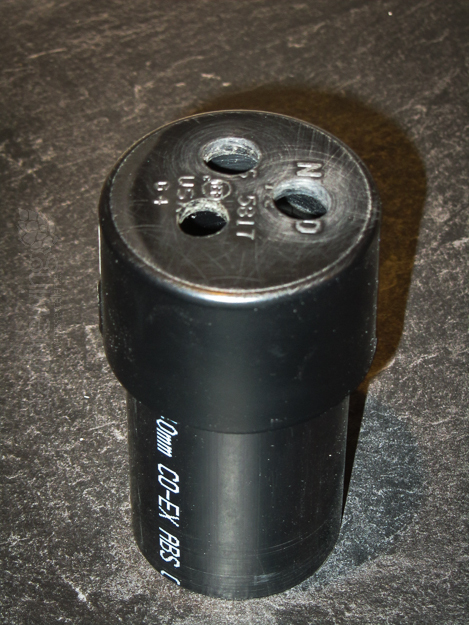 The large caps would go at the bottom of the pipe, inside the fridges, and the short caps would go on the top end, essentially just keeping the pipes in place and preventing them from falling. 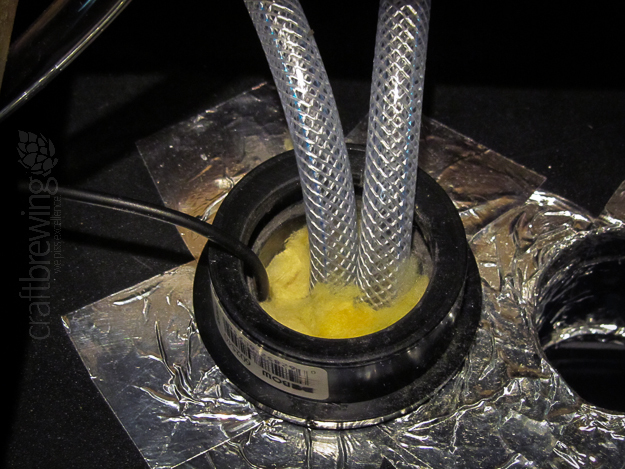 I installed the gas pipes, ran the lines and power cords through, and then stuffed them with insulation to help prevent temperature loss. 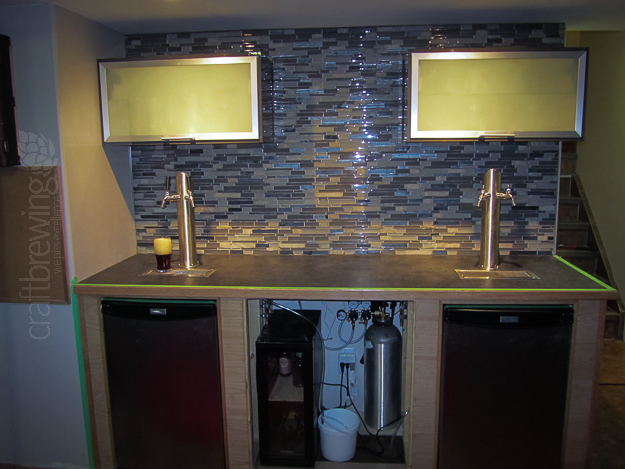 Before I installed the towers for good, I put up the tile behind the bar. 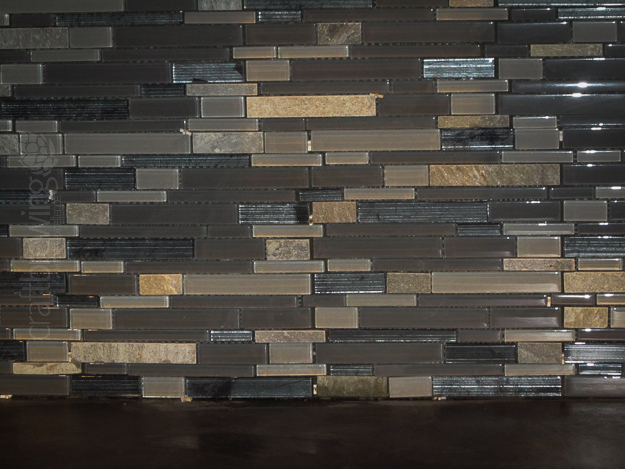 I used a linear mosaic tile that I found at Home Depot. I cut the tiles with a wet saw that I borrowed from a buddy, which made life much easier…other than the fact that the guard for it was missing, so I got soaked each time I made a cut! Here are a couple of shots before I grouted this bad boy. 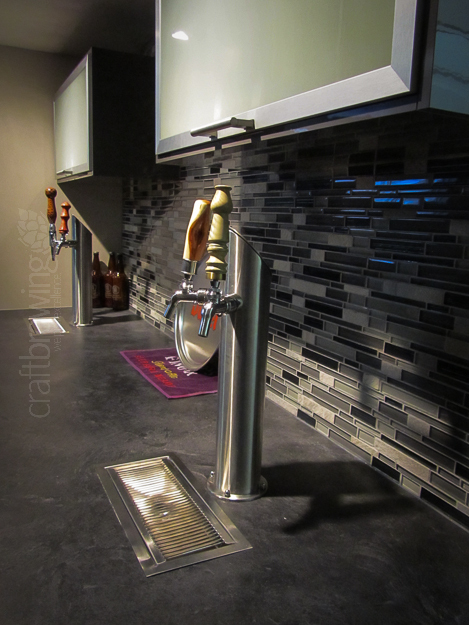 The next day, I grouted the tile, taped around the bar to silicone around the counter, sides, and base (I did around the base so that, if there was a spilling disaster, I wouldn’t have beer getting under the bar…seemed like a solid play. 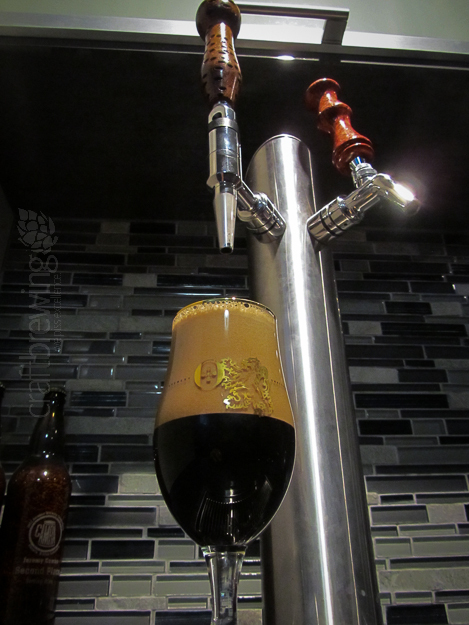 Here’s a quick shot of the first beer I poured, once I installed the towers. Note the excessive head…the beer wasn’t chilled quite enough; also, it was my first pour. Cut a guy some slack! I took some time to decide on the colour for the wood. My wife made the brilliant suggestion to leave it as it was, but with varnish. 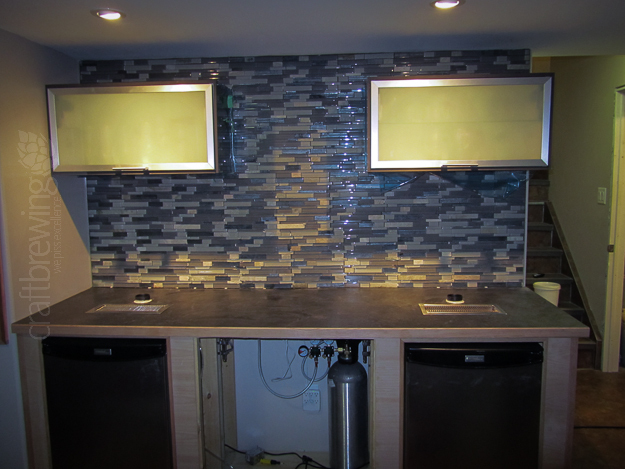 Leaving it light helped to make up for the darker colour choices I made with the bar top and tile. Once I hit this point, I stalled out for a couple of weeks. I was working up the motivation to tackle building cabinet doors for the first time. 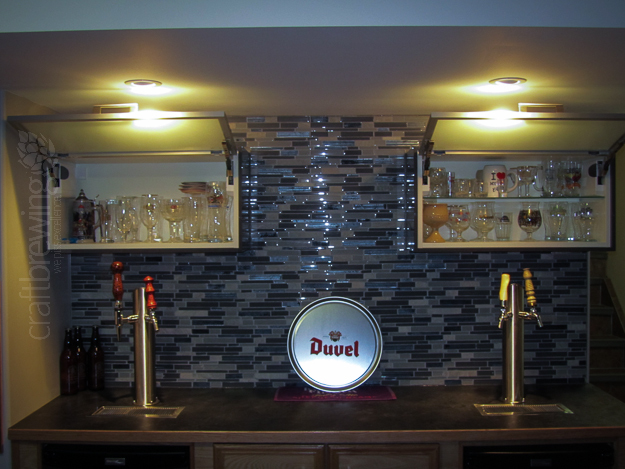 In the meantime, I decorated the bar with a sweet Duvel serving tray a buddy grabbed while in Belgium, as well as a few bottle trophies scored at the BrewVic CAMRA homebrew competition in 2012 (shameless proud homebrewer plug). 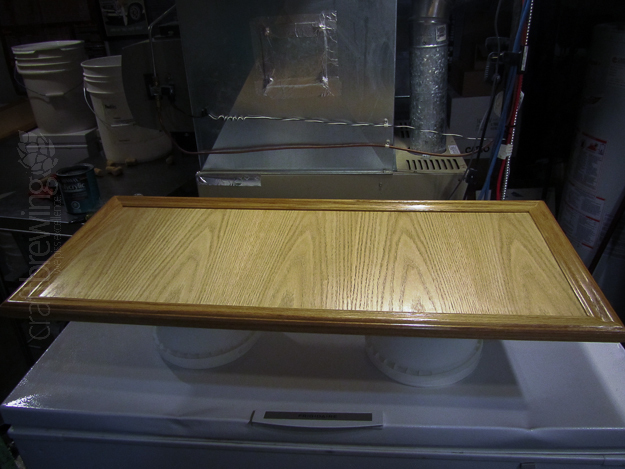 I wound up building two cabinet doors using leftover pieces cut from the original 4 x 8 oak plywood piece. Having been smart about how I cut out the first pieces from the bar, this wasn’t a problem…providing I didn’t screw up my cuts! I used some wide oak trim – again from Home Depot – to create a ‘these are doors’ look. I owe the success of this operation to taking a million measurements, making two million slight cuts with my power mitre saw, and a whole lot of luck. I secured the trim to the plywood with wood glue and set heavy books on them to hold the trim down while everything dried. 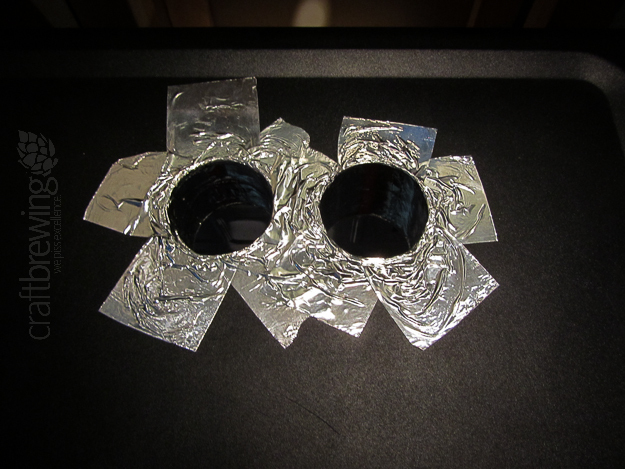 I then gave them several coats of varnish. While I was building the doors, my wife surprised me with some beautiful tap handles that she sourced out on her own. Apparently, her only requests of the supplier was that they all had to be somewhat phallic in shape. I’m not quite sure what she was getting at with that…but I think I like it. I installed the doors with some hinges I grabbed at a specialty door hardware store, as I couldn’t find anything I liked at the big box hardware stores. I put on Ikea handles that matched the handles on my cabinets, and I was done! 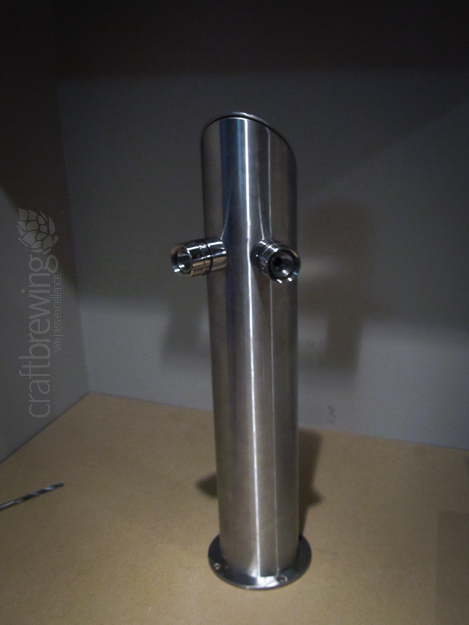 The only upgrade done since was to install a nitrogen setup for my stouts…so you’ll see the stout faucet in the remaining pictures. What follows is a little gallery of glory shots of the finished product.